Home/Nutrition/Cherries – Are they Healthy and Safe for Diabetics? Diabetes is a health disorder which needs to be monitored carefully so as to avoid blood sugar spikes. Carbohydrates are not good for diabetics as they raise the blood sugar levels instantly. It is therefore important to choose what you eat wisely. Fruits can be thought of sugary foods which should be avoided if you are diabetic but this is not actually true. Non starchy vegetables and fruits are best ti opt for in your diet as they contain a boost of nutrients for a healthy mind and body. Now, there are fruits even healthier than the non sugary foods which includes cherries on top of the list. Cherries – Why are they Beneficial for Diabetics? 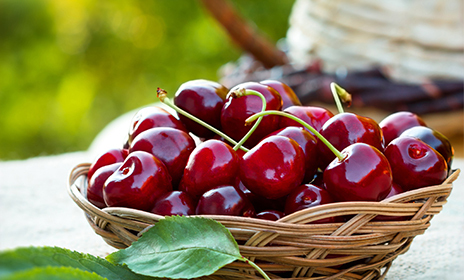 Cherries contain a lot of nutrients including Vitamin C, potassium, fiber, and polyphenols. They are low in calories and do not cause the blood sugar levels to go too high although it is better to eat them in moderation. Since every individual has a different system response to various foods, it is better to check glucose levels before and after eating cherries. This will assure if your body allows you to eat the fruit and has a positive effect instead of affecting you negatively. How Do Cherries Manage Blood Sugar Levels? Cherries regulate glucose levels in the blood which plays a role in diabetes prevention or even management. The fruit is also a rich source of antioxidants and can produce insulin in the body which diabetics often fall short of. Overall, cherries can be a healthy part of your diet which makes it essential for nutrition as well. Cherries have a low glycemic index of 22 if they are sour and fresh and a medium glycemin index of 62 fir the fresh sweet ones. It is therefore better to know which option you are going for. It is better to avoid canned cherries as they are loaded with additonal sugar content and also not add sugar when you are having the fresh and sweet ones. Cherries with green stems that are also shiny and plump should be chosen. The ones with the stems intact will last longer. Do not go for the ones with cracks and spots on them. Cooking cherries should not take more than a few minutes as they will lose their texture and brightness. Also, you may use the side of a knife to pit a cherry just like you do with garlic. This will ease your work particularly if you do not want whole cherries. What are the Other Fruits Good For Diabetes? Diabetics have to choose wisely when it comes to carbs and sugars as both can raise their blood sugar levels. Other fruits that can help fight diabetes include apricots, peaches, apples, oranges, pears, and green kiwi. Cherries are a healthy option for all those looking for nutrition and health benefits. Diabetics can enjoy the fruit keeping the calories and sugar intake in mind as roo much of them can be harmful. However, when taken in moderation, cherries are best source of healthy carbs which also regulate glucose in the blood and produce insulin. Try to opt for the sour and tart version of cherries as they are lower in calories and will benefit you more than the sweet ones. Overall, cherries will be a smart addition to your diet if you are diabetic or want to prevent diabetes in future. The tart cherries can also help fight inflammation. So, there is nothing to worry about having cherries if you keep portion control even if you are diabetic as your body will benefit from the nutritional value.